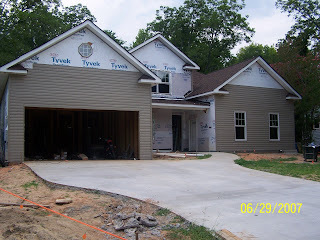 We are still working on the house. 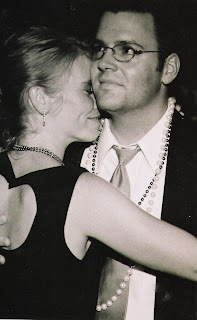 My dream date of being in before the ordination came nowhere close. Now I'm hoping we'll get in before the end of the summer. Well...a girl can dream can't she? I have been looking for a way to post this video since I first saw it a few months ago. Thankfully, someone finally put it on YouTube and 4andcounting found it. Unfortunately, the only way I could find it is in two parts. But, please, watch them both. Let me warn you though. This video is only for the brave of heart. You may just want to be a priest after you watch it. So gather your kids, siblings, parents, WHOEVER you can find, and sit down and watch it together. You’ll be glad you did! 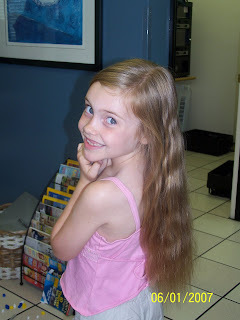 I have been in many plays, commercials and even local TV shows. I don't really get nervous or emotional. However, when it's just me up there in front of all those people I have a tendency to let my emotions get the best of me. Yes, I'll admit it, I'm a crier. The first reading at the ordination was Jeremiah 1:4-9. The day Aaron called and asked me if I would be willing to do it, I was simply blown away at the honor. I hung up the phone and immediately got out my Bible to look the verses over. And, no, I'm not letting any of you off that easy. You're going to have to dust off those Bibles and read it for yourselves. I will say, however, that the scripture was absolutely perfect. It was as if Jeremiah wrote those words for each of those young men. I practiced it so much over the last two months that I had the entire thing memorized. I never intended to do it from memory, I just wanted to know it well enough that if I did get nervous, I would be able to get through it. When I was at the rehearsal Friday night, I asked mom to listen to it one time before I did it from the ambo. I got two-thirds of the way through and choked up. I looked at my mom with tears in my eyes and said, "I'm not going to be able to do this." I'm very self-conscious about crying in public, although you'd never know it because it happens often. It's a gradual thing. Usually I can hear my voice start to shake before anyone else. The harder I try to overcome it, the worse it gets. That's usually when the tears well up in my eyes. Once that happens, it's usually Katie bar the door for the flood gates to open. The morning of the ordination I awoke before the alarm clock went off. My stomach was in knots. It felt very similar to the day I got married. The whole thing just caught up to me. My little brother was going to become a priest today. God was going to work a miracle in front of my very eyes. Not only was I going to be sitting in the front row, but I was going to be an active participant. "Oh Lord," I prayed, "please don't let me humiliate Aaron. Please, please help me keep it together." I tried practicing in front of the kids in the car while Nelson got us checked out. I burst into tears. I tried it again. I cried. Nelson came out to the car. I cried. We drove to the cathedral. I cried. I hugged at least ten priests on my way inside. I cried. I took my place in the front row. I cried. My parents prayed for me. I cried. The processional was "O God, Beyond All Praising". I cried. Aaron came in and sat next to my parents. I cried. They called him by name and he stood and said, "Present." I cried. Then it was time for my reading. The acolyte came down and escorted me and the second reader up to the altar. Suddenly I was no longer crying. I took my place and looked out over the standing room only crowd at the cathedral and began, "A reading from the Book of the Prophet Jeremiah". You know that peace that surpasses all understanding that everyone talks about all the time? It was with me. I don't know how else to describe it other than to say I felt as if the Holy Spirit was speaking through me. My voice was confident and calm. I shed not one tear. I ended with "The Word of the Lord" and took my seat behind the ambo to wait for the second reader to finish. At that moment, before I even settled into my seat, a priest friend who could see me from where I was sitting told me he saw me do a physical "Phew" with my body. And then...I cried. Let me tell you sitting up on that altar singing the Responsorial Psalm with all of those priests was something else. “Shepherd me O God, beyond my wants, beyond my fears from death into life.” How appropriate was that! 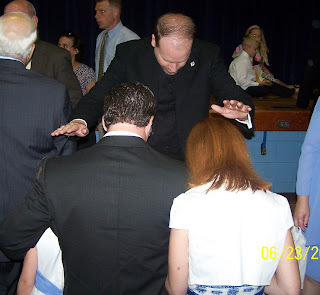 If you’ve never been to an ordination, you need to go. It is a beautiful service that will move you in a way no other mass will. If you’ve never read those verses in Jeremiah, go get your Bible and read them. They are awesome. If you’ve never had a brother who is a priest, I can now highly recommend that too. If that’s not a possibility, raise one yourself. Let me tell you, after this weekend I wanted to send at least one of my boys straight into seminary. I've discovered that an ordination is just as exhausting as a wedding. It also has many, many blessings. I promise to post a few photos and some information about the big day as soon as I catch up on laundry, meet the deadline for an ordination article I'm writing and clean up the house for mass tomorrow. The kids have tolerated all of the activities exceptionally well, especially considering that most of them required that they sit still and be quiet (the ordination itself was over 2 1/2 hours). Sunday morning as we were getting ready for church Mackenzie came into my room. "Why don't you go ahead and get dressed for church," I suggested. "Are we going to another ordination today?" "No. Today is Uncle Aaron's Mass of Thanksgiving." "Oh," she said. Then after a brief pause she asked, "But why is he saying a Mass of Thanksgiving when it's not really the season for that?" 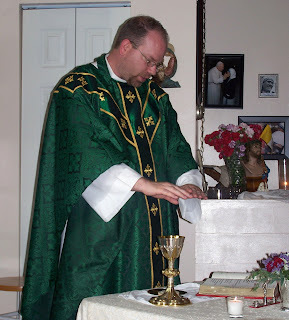 Today Father Aaron had one request - to say a mass for the family in Mom and Dad's house. Well, that and he wanted taco salad for dinner. 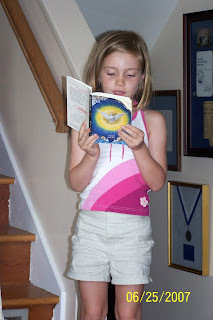 Mackenzie read the Responsorial Psalm all by herself (with a little help from Uncle Kevin). 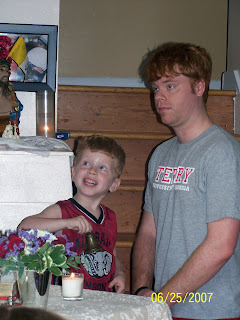 Kevin washed the hands of his brother, the priest. Father Aaron did what he'll be doing for the rest of his life. He brought Jesus to the people and the people to Jesus. And Aiden got to be an altar server for the very first time. And so we gathered together in the living room this evening much in the way it all began - a family praying together. Let me introduce you to my brother, Father Aaron! I know the hour is late but my heart is heavy and I have lots to do in order to get us on the road to Savannah sometime after the sun is up. However, at the top of my list is to beg for your prayers. The four men preparing for ordination and their families are under some serious spiritual attack. One has a father who has been in the hospital the last several days. He came home last night, but they all could use your prayers. 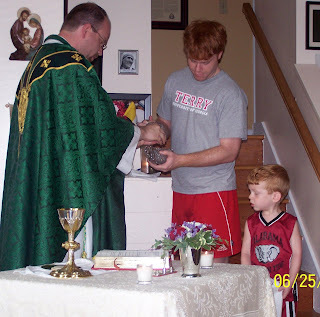 Heaven forbid that this father miss his son's ordination. My uncle has been taken to the hospital for the second time in several days. They're not sure but they think he's reacting badly to the chemo. It will take nothing short of a miracle to get him to the ordination on Saturday, but that's what he wants more than anything in the world. My brother met with the organist yesterday about the music for his first mass. A friend of his arranged for a hand-picked choir and they just needed the organist to accompany them. He refused. Yep, that's right. Refused. He said something about not knowing the music and then he fired off at the pastor saying Aaron's choices were liturgically incorrect. These three things are just a sampling of what these guys are facing as they approach the biggest day of their lives. Please join me in prayer that Keith and my uncle make it to the ordination and that a perfect replacement organist will be found for my brother's first mass. While you’re at it, please pray for the rest of us as well. There are a number of extended family members traveling over the next few days. Pray for the health and safety of all of us. Especially pray for Johnny, Aaron, David and Stephen that the Lord will protect them and give them peace. Tonight we were at a farewell reception for a priest who is a dear friend of ours. While I was making my way around the food table I spotted this. Obviously, it was cheese. But really, if I opened my refrigerator and saw this, I would toss it in the trash. There was a lady standing next to me who was very near 90 years old. I turned to her and asked, "Do you by any chance know what this is?" 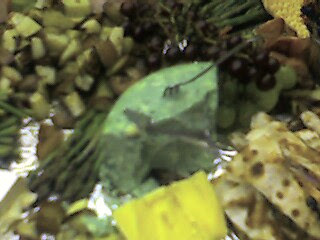 She looked at the green chunk and said, "It's c-h-e-e-s-e."
I smiled and nodded politely thinking, ‘No kidding. I KNOW it's CHEESE.’ Then she pointed to the items on the left of the cheese and said very slowly, "And this is a-s-p-a-r-a-g-u-s."
Today I was sitting in the kitchen making a check list of all the things I need to do before the ordination when it hit me - ordination – my little brother - A PRIEST! Kind of silly, I know, considering the fact that he has been in Rome preparing for this day for the last four years. Of course, he was in Maryland for two years of pre-theology before that. And, oh yeah, the two years before that he was in Macon as the assistant to the diocesan vocations director. But really, I didn't see it coming. In fact, I was pretty sure he wanted to be anything EXCEPT a priest. Then he spent that two years with Father Brett and he entered the seminary. But that was all he was doing. He wasn't going off to be a priest. He was just discerning. Then the bishop decided to send him to Rome. Still, he was just discerning. But with each passing year (or every six months when I would ask him the question) I heard less doubt in his voice. Peace replaced doubt and eventually turned into confidence. And now, eight years into the discerning process, "God willing" as every true seminarian says until the moment of ordination, he will rise to his feet at the ordination on Saturday a priest forever. With T-minus 4 days, 13 hours and 17 minutes to Aaron's ordination (courtesy of a countdown clock on my desktop), talk around here these days has centered on vocations, ordinations, and priesthood. Yesterday on the way home from mass the question came from Aiden. "What does ordination mean?" "It means that you are touched by the hand of God," I answered. "Oooh," he responded with genuine awe, "I want to be ordained." "I want to be ordained too," Dawson added with full enthusiasm. This morning as Aiden was standing on the toilet, Superman cape around his neck, watching me put my contacts in, he was still buzzing about becoming a priest. "I think that would be great Aiden. I just want you to do whatever God tells you to do," I told him. "Okay Mama," he said in a matter-of-fact conversational tone. Then he added, "And if God asks me to be a super hero, I'll do that too!" Thank you for always being there. Thank you for always speaking the truth - even when I didn't want to hear it. Thank you for always knowing how and when to make me laugh. Thank you for your thoughtfulness (like calling me when the ties are on sale at Macy's :)). Thank you for continuing to be my Daddy even though I am a full-grown adult. Thank you for welcoming my husband as your son. Thank you for loving my children the way you do. Thank you...for just being you. For someone who spent most of his life with no father figure at all, I think you've turned into a pretty great dad. In fact, I know you are the perfect dad for me. We've been keeping Mackenzie's haircut under wraps until all of the family got to see her in real life. She wanted to give them a big surprise and it definitely worked. 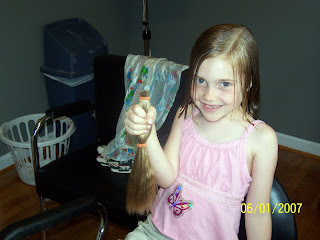 She's been growing her hair out for over a year and a half for Locks of Love. She has wanted "really long" hair for sometime. I've never really been a fan of hair this long so we made a deal. I'd let her grow it out if she would then donate it to a great cause. Thanks be to God, we got it to just the right length in time for the summer. She and I both love it. And now some other child will love her for it. They say a picture is worth a thousand words. This one always has been. It captures, in a split second, our marriage these last nine years. When I said, "I do," I did. I threw myself and my will (well most of it...okay, I'm still working on this one) into your arms. It's in your arms that I feel safe. In your arms I am content. In your arms I am loved. In your arms I am reminded of the thousands of reasons I committed my life to you. You are the love of my life and I am so happy to be the one in your arms! 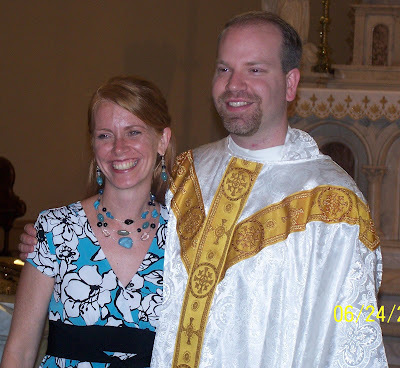 My brother, the deacon, soon to be a ordained Roman Catholic priest, came home for good last night. We celebrated tonight with a family dinner. After we finished eating and were sitting around the table catching up, Aiden got up and went over to sit in Aaron's lap. Aaron was showing us his holy cards for the ordination and the chalice he purchased. Aiden was fascinated and streaming off his usual questions when Aaron looked at him and said, "You'll have these things too when you become a priest." Without missing a beat Aiden responded, "No. I'm going to be Pope!" Aiden has developed a habit of holding the phone away from his ear when someone on it is talking to him. Yesterday at dinner, my mom called and he was talking to her, holding out the phone. He looked at me with phone in hand and his elbow propped on the table. "Mama, why is the phone so heavy?" he asked in earnest. "Is it because Bama is inside of it?" Yesterday we attended the wedding of a grade school friend of Nelson's. At the reception there was plenty of dancing. Well...plenty of dancing by my family. We were out there EVERY SINGLE song. The boys required a partner most of the time, but not Mackenzie. She was groovin' to almost every song single and having the time of her life. 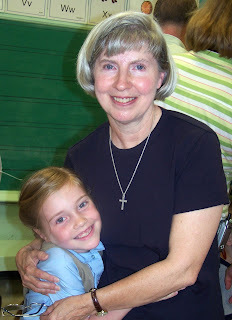 At one point she boogied up to me and said with the biggest smile and widest eyes, "Oh Mama! I could just dance ALL NIGHT LONG!" In all the hustle and bustle of the end of the year, I didn't get the chance to honor Mackenzie. 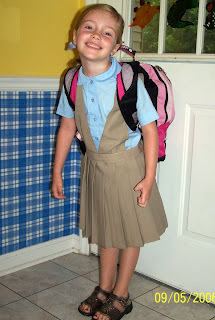 At her school, the last day is a BIG deal. Of course, that probably has more to do with it being the last day than it does with the awards! Mackenzie was awarded for memorizing all nine monthly scriptures again. I am really very proud of her for not only doing it, but wanting to do it. Because it is such a mammoth feat, I was waiting for confetti or something besides a measly piece of paper that recognizes these kids for what they've done. However, we celebrated the certificate and rewarded her ourselves with something a little more. 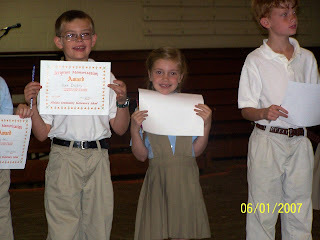 In the classroom, Mackenzie's teacher honored each student with an award for a virtue she saw him or her demonstrate over the course of the year. Mackenzie's was for purity and on her certificate was Psalm 51:10, "Create in me a new, clean heart, O God, filled with clean thoughts and right desires." The new things she's learned still amaze me. 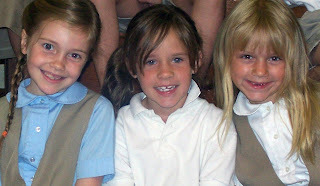 I am so grateful for Mackenzie, her school, her teachers, and her friends. I'm tempted to say that I can't wait to see what next year has in store, but quite frankly, I can. It's all going a bit too fast for me these days and I just want to enjoy my little six year old a few more months before she turns seven and enters the second grade. Great job Mackenzie! We’re so proud of you! Boy, oh boy, school is out, but my check list just keeps growing. When I listed all those things the first time, I almost forgot that I agreed (okay, volunteered) to do a graduation cake for a friend's son. Crazy me. I have to admit that I thought it would be...pardon the pun here...a piece of cake. He's the resident basketball star. I did a basketball graduation cake for Kevin. Easy - I thought. 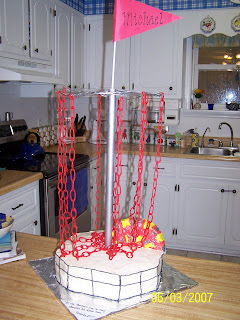 That is, until I got the call Tuesday night (cake was for Sunday) that he did not want a basketball cake, but a disc golf cake. Disc golf? I have heard of it but had no idea how this would translate into a cake. Of course any sane person would have done a nice round cake, colored it up like a Frisbee and called it a day. I am not sane. I did a little research on the internet and decided to try to do the whole basket. Yeah, I know, I'm a bit of a masochist sometimes, but it was for the president of the class. I really wanted him to think it was cool. It doesn't matter how many of these kinds of cakes I do, they always take longer than I think they will. I spent Tuesday researching, Wednesday shopping, Thursday painting, Friday chain making, and Saturday...ALL DAY cake creating. 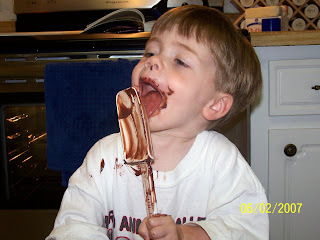 To top it off, Nelson was out of town all weekend and it rained Saturday so the kids were stuck inside with me and the cake. In an attempt to entertain, I let Mackenzie and Aiden help out. They love dumping stuff in the bowl, cracking eggs and turning on the mixer. 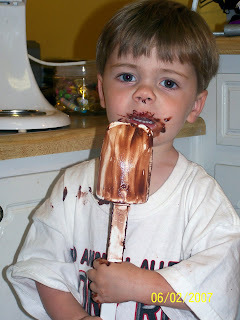 Dawson loves that too but this time I let him be the taste tester. As you can see, he approved whole heartedly. To make matters worse, after two late cake nights, I awoke Sunday morning with a serious stomach bug. 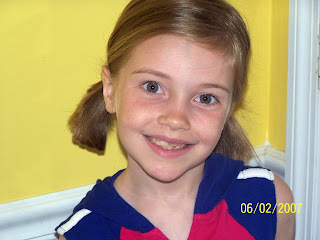 Mackenzie had it too. We missed church, the graduation and the big reveal of the cake. And, oh yeah, did I mention Nelson was out of town? I'm not sure what God had in mind. I'm just glad it's over. 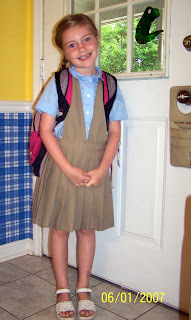 Here is Mackenzie on the first day of First Grade. 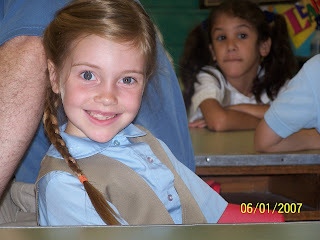 The picture that follows is her today, on the last day of First Grade. Is it me or does she look huge? How did this happen? When I came home after the awards and threw one of her uniforms in the wash I almost cried. I'm not sure I'm ready for time to go by this fast. Ready or not, it marches on. What a difference a year makes. Thank God for the summer!